Conversational interfaces are on the rise. Customers are increasingly communicating with businesses via chatbots and voice assistants. Businesses currently face the challenge of selecting the right channel and then transforming their content and data into a voice or text dialogue for these channels. You have already a heap of customer interactions? Benefit from your very own customized multichannel chatbot solution (in text or voice). It will be based on our proprietary AI which includes conversational modules, ensuring a faster implementation cycle. Benefit From Our Key Features! No matter what channels your customers use – with Onlim you´ll be there for them. Chatbots for your website, on messenger platforms or on voice assistants such as Amazon Alexa or Google Assistant (Q4) are already available. We offer a highly flexible solution to integrate your company´s content or external data into your chatbot via standardized APIs. To answer your clients´questions we then transform it into natural language through our AI. After setting up your Onlim bot you can easily manage your chatbot’s content. 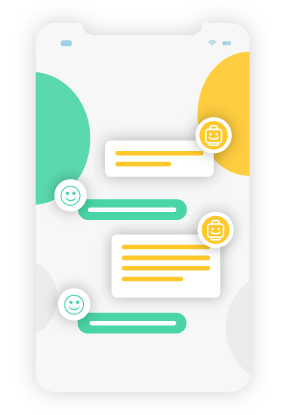 You can: create and adapt answers/questions, monitor all conversations and also instantly switch from the bot to your customer success team or vice versa at any point/time. For even quicker time to market and for companies who already know what they want: Onlim offers specific content templates and modules for specific industries such as hotel, tourism, retail, utility and many more. We provide the Onlim platform as a SaaS model. Each project has a dedicated customer delivery manager who is responsible for the project until it goes live. All our bot implementation projects consist of 3 phases. We will develop the main requirements together you. First through a call – followed by a workshop – we define the detailed features and the scope of the project. Here we setup the chatbot or voice assistant and start to train our AI platform. Ongoing testing assures that everything works as defined before going live. This phase starts directly after going live. Hosted on the high security Onlim platform we provide an easy to use backend interface to our platform where our clients can change and adjust their content as they wish. These are just some of the main features. Let us help you automate your customer communication! For customer service, marketing and sales. Is Onlim right for my business? Your company gets numerous customer service requests every day through email, phone or ticketing systems? You are looking for ways to keep up with changing customer expectations and want to add new channels to your marketing and sales efforts? Then Onlim’s chatbot and voice assistant platform is for you! How can my business benefit from chatbots? We want to learn more about your business and the challenges you are facing in customer service, marketing or sales. Then we can determine if our chatbot and voice assistant solution is the right choice for your business. Ready to start your AI-powered, automated customer communication journey? Let’s talk!